This is a piece I wrote a few years ago when my twins were three. I thought it might be useful for anyone who is about to, or has just had twins and is contemplating the difficult issue of breast- or bottle-feeding. It doesn’t have to be either/or, and after a lot of muddling through, I managed to combine the two with my twins for seven months. It is quite a long piece, but I feel it covers a lot of issues you don’t find in twins books. A shortened form of it appeared in the Tamba magazine in 2011. 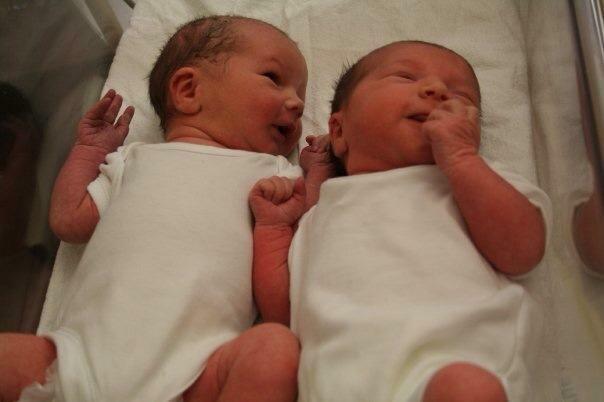 My twins are now three years old – life is so much easier now than it was a year ago! The first few months after their birth were the hardest of my life, despite being over the moon to have my “instant family”. Part of what made the time immediately after the birth so difficult (apart from the sleep deprivation and getting over a twin delivery!) was the anxiety and guilt over the decision not to exclusively breast feed my babies. I can look back now and feel happy that I managed to mix breast and bottle-feeding for seven months, but it wasn’t plain sailing partly due the fact that there is almost no information on how to successfully combine breast- and bottle-feeding twins. I muddled through and found a way that worked for me and my babies, but I felt that I wanted to share my experience with twins-mums-to-be in case it can be of any help. I was always certain that I would exclusively breastfeed any baby I had, and when I discovered I was expecting twins, it never occurred to me that I would treat them any differently than if I had had them as singletons. After reading a couple of books about twins, plus the tiny sections on twins in other baby books, I felt confident that that was not only possible, but straightforward. I’ve since realised it was just the first of many situations where I had to let go of the idea that I could approach raising twins in the same way as raising a singleton. There is a lot of information available on the benefits of breastfeeding, but next to nothing about bottle-feeding. This is to encourage mothers to breastfeed, and rightly so, however what happens if you find you are unable to? Where is the information on how to choose formula, how to ensure you don’t over-feed your baby, what to look for in a baby bottle? And what about if you don’t want it to be either/or – where is the information on combining the two? This is particularly important when it comes to twins. No matter how many books you read or advice you listen to, nothing prepares you for the reality of caring for and feeding two newborns. My daughter fed within a few hours of delivery, but my son wasn’t interested. I felt so exhausted from the birth that I probably didn’t persist with feeding them as frequently as I should have within the first 24 hours of birth. This may be a contributing factor to the fact that I simply did not have enough milk to feed my two exclusively, and I never experienced the milk let-down. They lost a lot of weight in their first week, which is common, however they lost up to the maximum that is considered “normal” and were dehydrated. I tried pretty much everything to build up my milk supply – I ate and drank as much as I could (my hips regretted it later!) I fed the babies frequently – sometimes every hour or hour and a half – which meant I sometimes had no gaps between feeds, because as soon as I finished feeding one baby, the first one was hungry again. I felt that my breasts never had the time to “reload. I then started to feed them simultaneously to save time, but I found breastfeeding very painful at the beginning, partially due to both twins being tongue-tied. Having pain in both breasts at the same time was hard to bear. Also, as a novice at breastfeeding, it was hard to latch one on and then latch on the other – the first one always seemed to slip off, which increased the pain. After a week of this, and my babies still being dehydrated, unhappy and losing weight, the community midwife told me to top them up with a bottle. I was initially reluctant, but I really had no choice as they were not thriving, and they were not receiving enough nourishment from breast milk alone. In a way, it was a relief that I no longer had a choice, but I felt like I had failed at my first task as a mother. I felt guilty that I dreaded each breastfeed because of the pain, and that maybe this had contributed to their failure to get enough nourishment; I felt guilty with every top-up bottle I gave because I felt they weren’t receiving all the benefits of breast milk; I felt like a failure as a mother and as a woman because I alone couldn’t provide the most basic of needs to my newborns. I thought to myself “How would I have cared for them in the wild?” All I can say is sleep deprivation, first-time-mother panic and the guilt of not keeping to the letter of what is recommended is a potent combination for feeling depressed and anxious. I started out breastfeeding each baby in turn, then passing each to my husband to top them up with a bottle. This didn’t work for me. The whole process used to take about two hours from start to finish, even with two people. I also never knew how much to top up with, and in fact we ended up overfeeding the twins (yes, it is possible with bottles) and they vomited frequently, had bad wind and tummy aches, which didn’t help the colic. I realised at the end of my husband’s four-week paternity leave that this wasn’t sustainable, even with support. I woke up one morning (or night – it’s hard to tell in the early stages!) and realised I had to change the routine if I was going to be able to continue to breastfeed at all. I decided literally to half breastfeed, half bottle-feed. I would breastfeed one baby and bottle-feed the other for one feed, and then swap over at the next feed. Alternating feeds worked really well for me. It meant if I was on my own, the process of feeding two babies didn’t take so long because bottles went down a lot faster than a breastfeed. I could monitor, at least half of the time, exactly how much the babies were taking, and I knew I would have enough breast milk for a feed now that I wasn’t trying to split each feed between two babies. Also, it meant that if I did have someone else around, they could give the bottle at the same time as I breastfed, which saved a lot of time, especially if we were out and about (the few times we were at the beginning!) It also meant that over-feeding was not such an issue, since I could more or less follow the guidance on the formula packet, without trying to guess how much breast milk they had taken. If either looked like they needed a top-up between feeds, I used to offer the breast, so that I kept my milk supply up and they didn’t start getting more bottle than breast, and then start to reject the breast. It also meant that they weren’t too over-full for the next feed and get out of step with their sibling. My milk supply easily coped with what was the equivalent of feeding one baby. In fact, once my two started to go a little longer between feeds at night, I started to have enough milk in the mornings to breastfeed both (one after the other. I confess I never mastered the art of breastfeeding in tandem). Then at the 11pm (ish) feed, my husband gave two bottles so that I could have some extra sleep. If it happened that I was giving an odd number of feeds in a day, for example seven, I would alternate daily which baby got four breast feeds in a day so that I didn’t end up with one having more breast than the other. After a while, I actually did end up giving more bottles to my son than to my daughter because he was the hungrier baby, and she was a very windy baby and was more comfortable after a breast feed. Nights didn’t follow too much of a pattern. I just tried anything to get them to sleep – sometimes just offering the breast so there wasn’t the hassle of preparing bottles, sometimes just giving bottles in the hope that formula would keep them fuller for longer. I did have to stick to a feeding routine in order for this to work. I only started doing that when they were a few weeks old – I don’t think newborns are really capable of any routine to start with, and I think muddling through as best you can is probably the only way, until you find something that suits you and your babies. I eventually worked out (with the help of my health visitor) how many feeds the babies needed in a 24-hour period, and tried sticking to a 3- to 4-hourly cycle once they were a few weeks old. Again, this was an adjustment as I never thought I would impose a rigid routine to newborns, however I needed to get the twins in synch somehow, otherwise I really would have lost my mind! I was as flexible as I could be, and did offer top-ups of breast-milk if they were hungry. It was always a bit of a juggle when the babies grew out of one routine and needed a new one, for example, when they were ready to drop a feed. It’s difficult to tell if they are ready to drop a feed if you have them in a routine and not feeding on demand. You end up being afraid of changing the routine in case it messes everything up and your babies end up cranky, and you more tired. Again, I had a good health visitor who helped me with that. I am very lucky that my babies took so easily to combining breast and bottle, because I know that some won’t take to bottles at all, and some won’t go back to the breast once they have had the quick and easy flow of a bottle teat. I don’t know if I had particularly easy babies in that respect, or if I by chance introduced the bottle at the right time for them to accept both. I can only tell you what worked for my babies. I introduced the bottle after they had been exclusively breastfed for one week. I thought that would be too soon, but it worked fine. If you introduce the bottle very late (say, a month or two down the line) they apparently may not take to it at all, however I obviously personally don’t have any experience to say that authoritatively. The type of bottle I used may be significant – there are a few on the market that say they are suitable for combination feeding. I personally used the Tommee Tippee “Closer to Nature” bottles, which to me looked the most like a breast(!) These served me very well. I also tried to replicate the latching-on to a breast when I bottle-fed. I would rub the teat by their lips, and wait for the babies to open their mouths for the bottle, rather than shoving it in so that they didn’t get out of the habit of opening their mouths to latch on to the breast. I didn’t do that all the time, because sometimes you just want to take advantage of the faster bottle and get it done quickly. This is probably the only problem I did have with combination feeding – my babies sometimes didn’t try to latch on properly to the breast. This problem did resolve itself, and eventually they did swap between the two as if it were second nature to them. I managed to keep going like this for six months, and then I gradually weaned them off the breast when I felt ready, and when I felt my babies were ready. After a while, I looked forward to breastfeeding my babies, because it no longer became a source of guilt, stress or pain. It did become a lovely feeling of closeness between the babies and me that no one else can feel. I hope that this opens up a third option to twin-mums that isn’t discussed in many books. I’m sure there are a lot of different ways of combining breast and bottle, and if that is what you want to do you will find your own way that works. I only wanted to show that it doesn’t have to be an either/or situation, and share the practicalities of how I went about it. I also hope to prevent other twins-mums who may not be able to breastfeed exclusively, from feeling the guilt that I went through. If your babies have received any breast milk at all, you are doing really well, because it is far from simple with more than one baby, and, I believe, practically impossible if you are not receiving support from others. In any event, your babies are not going to remember whether you breast-fed or bottle-fed them, but whether you provide comfort and love. There is so much more to being a mother. I hope my experiences are helpful to you, but do whatever is right for you and your babies. Breastfeed one baby and bottle feed the other at each feed. Alternate which baby gets the bottle or breast at each feed. Start with the bottle feed since formula takes longer to digest than breast milk. Try to get your baby to latch on to the bottle as if it were a breast. Don’t feel guilty about not following the guidelines to the letter. This entry was posted in Raising Twins, Uncategorized and tagged breastfeeding twins, combination feeding, nursing twins, parenting, Raising twins on May 21, 2014 by perplexedparent.